We love this beautiful time of year when the weather is finally cooling off, everything is changing colors and the holidays are ushered in with a flourish. The fall and winter offer a multitude of opportunities to incorporate some seasonal flair in your wedding day. One of the biggest ways to include seasonality in your wedding is through – what else?! – the food! Restaurants change their menu offerings to reflect the best foods of the season, and most caterers and reception venues do, as well. Not only does the in-season produce provide a framework of a sensational menu, but it also lends itself to creative and unique cocktail inspiration. Today, let’s focus on cocktails! Some of the most luscious fruits are at their prime during the fall or winter: apples and pears, all varieties of citrus, cranberries, and some more “exotic” options such as quinces, figs, persimmons, kumquats and pomegranates. 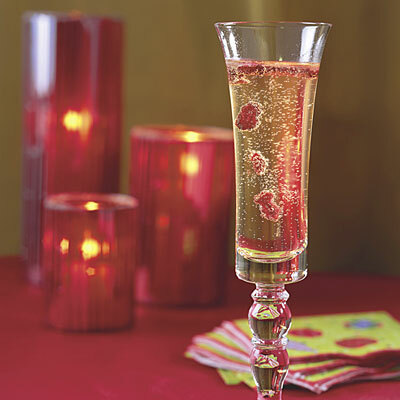 Your cocktail choice doesn’t have to be a completely new creation; you can use these fabulous seasonal options as a twist on a classic cocktail: Citrus Sangria, Pomegranate Martinis or Mimosas, Orange-Cranberry Gin and Tonic, Cranberry Mojito? Yes, please! Or go a little off the beaten path with something like a Pear-Basil Sipper, Apple-Ale Wassail, Frozen Cranberry Margaritos (a mojito-margarita hybrid) and La Vie En Rouge. Of course, you can always go with the tried and true holiday favorites, as well. Your guests are bound to enjoy beverages such as seasonal sparkling punch, creamy gingerbread or candy-cane inspired cocktails, frothy eggnog concoctions or some warm buttery drink. Mmmmm, is it 4:00 p.m. anywhere yet?! We hope this has inspired you to embrace “Fall” or “Winter” when creating your wedding day celebration and the cocktails that go with it. 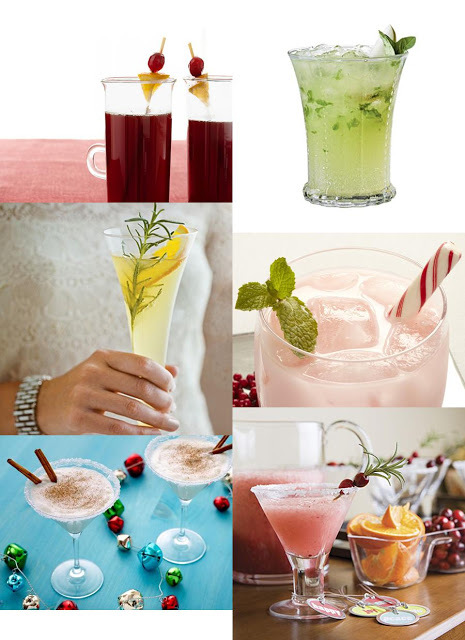 Put your holiday-inspired, party-minded head together with your caterer or bartender to develop the perfect seasonal cocktail for your wedding reception. Or, call us to meet with our fabulous wedding planners; they are experts at helping brides map out a seamless vision of an incredible wedding from beginning to end. Cheers! 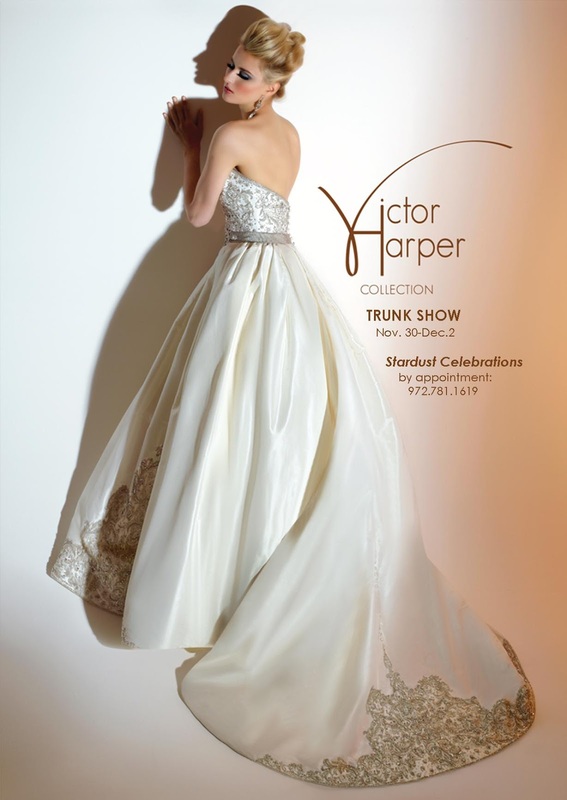 Join us at the Stardust Bridal Salon this Friday, November 30 through Sunday, December 2, for a trunk show for one of our newer fabulous new bridal gown collections: Victor Harper! This incredible wedding gown line features gowns of drama, refinement, femininity and elegance. Call now to make your appointment to experience these stunning Victor Harper ﻿bridal gowns: 972.781.1619. Something to be Thankful for: Two Great Trunk Shows this Weekend! We are thankful for a wonderful year serving our lovely brides and their entire wedding community. We look forward to continuing to work hard through the end of the year and into the next, helping make all of your wedding dreams come true. To that end, we bring you two more fabulous trunk shows this Thanksgiving weekend, November 23-25! 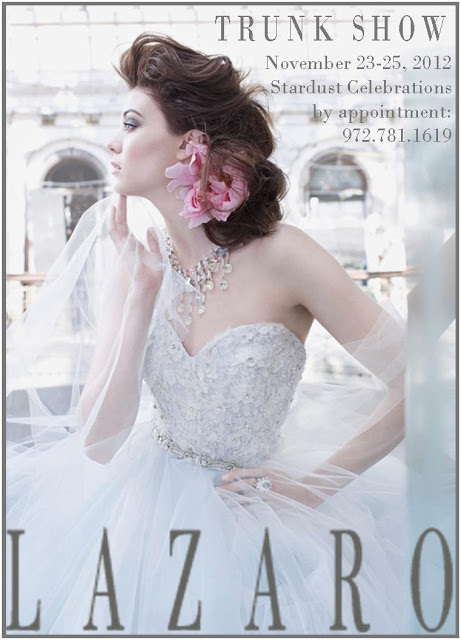 Lazaro is one of our most popular designers, and it is no wonder! His current bridal gown collection is representative of the incredible, uber-stylish designs he is known for. 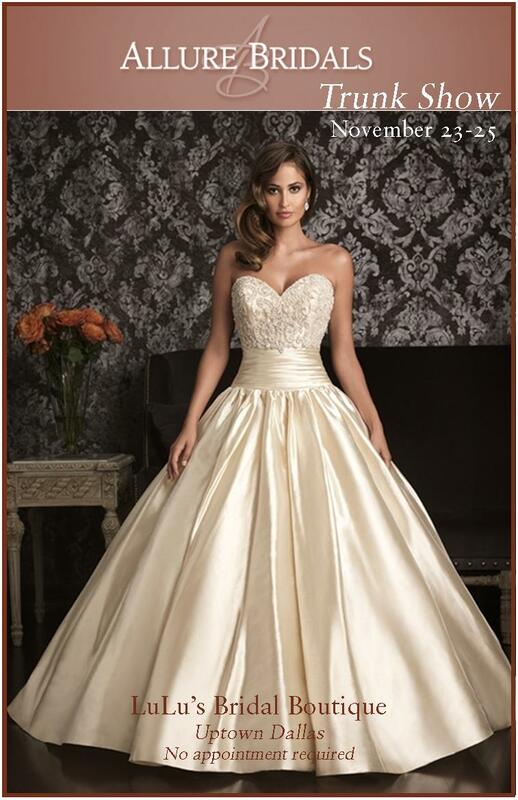 Make your appointment now to ensure your time with these stunning wedding gowns. Call our Stardust Bridal Salon: 972.781.1619. Allure Bridals is another fabulous bridal gown line that brides clamor after. LuLu’s Bridal Boutique is hosting a trunk show for the extensive collection this weekend. No appointment is necessary, but make plans to come in and see what beautiful styles Allure has to offer. We have been busy adding trunk shows to our schedule to bring you the very best selection of and greatest shopping opportunities for the most fabulous bridal gowns and wedding day accessories. Check out our updated schedule and mark your calendars. Please note that we have several special shows where a representative of the designer or the designer him/herself will attend the show! It is always great fun for brides to have their photo taken with the designer of their wedding gown – what a wonderful memento! Happy bride with the incomparable Lazaro; he also signed a sketch he drew of her in her Lazaro bridal gown. ?And, you will not want to miss that Victor Harper Fashion Show in February! Save the date now to experience firsthand the glamour and drama of Victor Harper bridal gowns! Remember, you should call for an appointment during a Stardust Trunk Show (972.781.1619), but LuLu’s does not require appointments. We hope to see you soon!